In past articles, we’ve written at length about the primary importance of antioxidants, the beneficial compounds that calm harmful oxidative stress and scavenge nasty free radicals, which increase your risk of nearly every chronic health condition. We’ve talked before about the incredible benefits of optimizing your glutathione levels. Because glutathione safeguards and amplifies the body’s own ability to ward off illness, its ability to protect against aging and illness is profound. Research has correlated low glutathione levels with the onset of many health conditions, including heart disease, Alzheimer’s, cancer, immune disorders, and more. In order to see how effective glutathione can be for hangovers, you need only understand the fundamentals of what’s happening in your body when you’re hungover. Here’s a brief breakdown, coupled with a summation of how glutathione soothes each of these hangover pain points. Glutathione depletion. This first marker should make it immediately obvious why glutathione is a natural hangover remedy. Excessive alcohol consumption has been shown to deplete glutathione levels, because your body is struggling to produce enough to counter the toxic effects of drinking. By providing your body with an extra dose of glutathione through supplementation, you’re essentially giving more ammo to your detoxification system—and the more quickly and effectively your body can detox, the faster you’ll recover from your hangover. Toxic liver metabolites. One of things that makes alcohol consumption so unhealthy is the toxic metabolites it leaves in your liver. 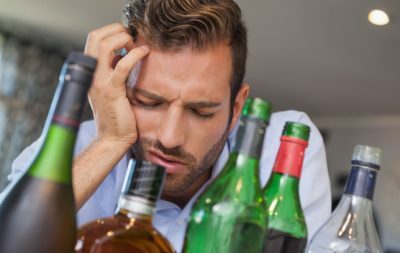 These byproducts of alcohol breakdown, called acetaldehydes, are even more noxious than alcohol itself, and are one of the main causes of the nausea, sweating, vomiting, and liver damage associated with alcohol abuse. A study published in the Yale Journal of Biology and Medicine found that glutathione helps neutralize acetaldehydes and other liver toxins, and conversely, that insufficient glutathione levels in the liver can lead to oxidative stress induced liver dysfunction. Inflammatory response. As we’ve often written about in past articles, inflammation is one of the underlying factors of nearly every health imbalance—and hangovers are no exception. During excessive alcohol consumption, your body responds as it always does in the face of invading toxins: it triggers inflammatory response to protect itself, and to hunt down foreign agents with radical oxygen species. As you probably already know, though, this inflammation and oxidative stress does more harm than good if it’s chronic or overly pronounced. Glutathione expertly controls inflammation, not by simply turning off inflammatory response (like painkillers), but by taking care of the toxins that triggered the response in the first place (so that the inflammation is no longer necessary). This is just one of the many reasons why clinical trials have demonstrated that glutathione supplementation dramatically improves hangover symptoms. All that being said, glutathione supplementation isn’t a license to drink irresponsibly. Moderation (mixed with proper food and water intake while drinking) is obviously the best way to avoid a hangover. But for those times that you inadvertently push things too far, glutathione can be a godsend for making it through the next day. There’s at least one aspect of being hungover that even glutathione can’t fix, though: dehydration. Because alcohol consumption causes you to urinate more frequently, dehydration is common—and the only way to remedy it is to (you guessed it) drink lots of water. Ideally, you should drink at least a full liter of water before bed if you’ve had more than a couple of drinks (or even if you’ve had anything to drink; water is always a good idea). Proper water intake, even just at the end of the night, can usually prevent the headaches and other dehydration symptoms associated with hangovers. If the damage is already done, though, just drink as much water as possible throughout your hangover day (preferably three to four liters). Add a half teaspoon of Himalayan salt (or other variety of unprocessed sea salt) to your water—doing so helps your body absorb and retain more of the water. Once you’ve hydrated, give yourself a good dose of glutathione. This is where it gets tricky, though: it’s notoriously difficult to raise glutathione levels through oral supplementation, and glutathione-boosting lifestyle practices (like moderate to strenuous exercise) don’t work well as an acute hangover remedy. Luckily, this cutting-edge formulation method has finally made glutathione supplementation effective. Korfactor Glutathione… the most potent and most bioavailable Glutathione supplement that you can find anywhere! Korfactor Liposomal Glutathione has been carefully crafted to support your body’s natural glutathione levels; detoxification processes, and put aging on hold. Pick some up to have on hand as a hangover remedy, or use it daily for increased energy and performance, supercharged immune function, and unparalleled liver support.